Around seven in the evening I decided to clean up one section of the tarantula terrarium. The enclosure has two sections, divided by a piece of glass, each housing a Cyclosternum fasciatum (Costa Rican tigerrump). 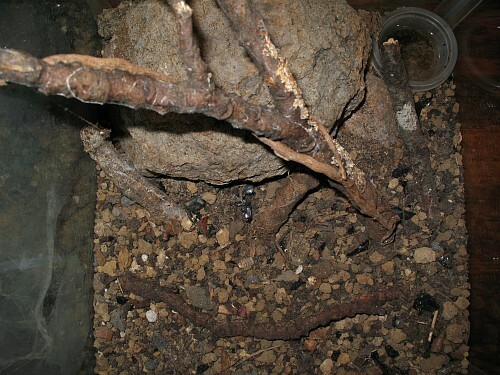 The tarantula spider in the right section has been hidden from view, it its burrow under a large stone, for many months now. But the one in the left section showed up a few months ago, and didn't return to its burrow under a large piece of wood. 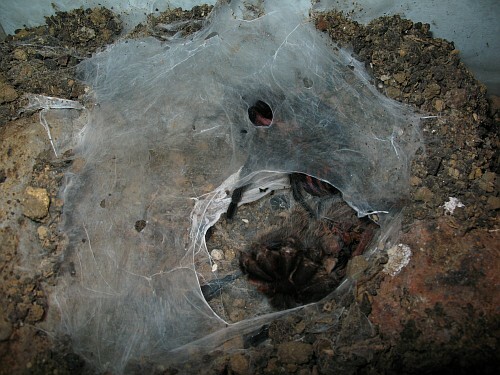 Cyclosternum fasciatum terrarium, left section with webbing in a corner. Instead it created a tent like structure using a lot of silk. Last week I noticed that it had used this tent structure to cast-off its old exoskeleton. And a day or so after I noticed the big spider had molted, it had wrapped the cast-off exoskeleton (exuvia) in some silk, and glued it to the "ceiling" of its tent. 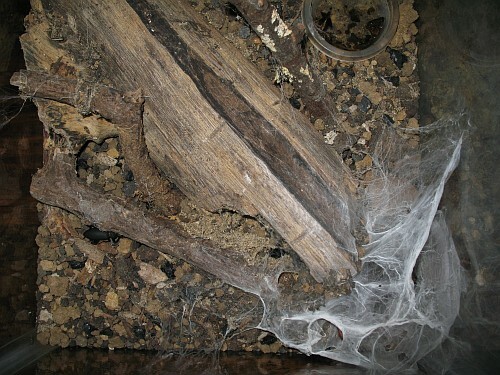 Right section of the tarantula terrarium. Since the left section looked quite a mess with all the silk in one corner, and since I didn't consider the tent structure a good hiding place for the tarantula, I decided to clean the section up, and provide a new hiding place to the large spider. 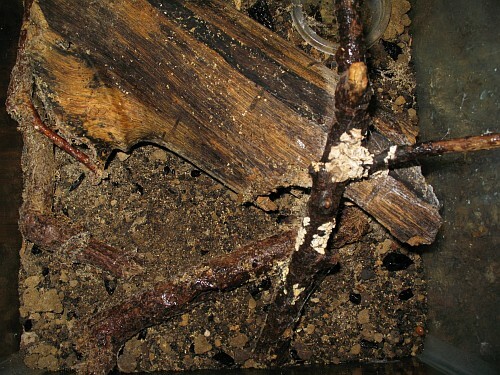 Left section of the tarantula terrarium after cleaning. I carefully captured the tarantula spider with a large plastic cup. This was not an easy thing to do. At first it was resting against the glass, and I tried to put the plastic cup over the spider. But it noticed my moves and ran for its tent. Next I used a long artist paint prush to annoy the tarantula enough to leave its hiding place, and with soft pushes I managed to get it walking on the glass. And this time I managed to move the cup over the tarantula. With a piece of paper I made the tarantula leave the glass, and move towards the bottom of the cup. Then I put the lid in its place, and put the cup with the spider out of the way. Cyclosternum fasciatum burrow with exuvia (right section). After I had removed the silk webbing, and moved the substrate a bit so I could create a nice hiding place under the large piece of wood, I misted the substrate and decoration a little. In my experience this species doesn't like a wet substrate very much. When I was satisfied with the result I released the tarantula in its enclosure. Cyclosternum fasciatum burrow covered by a large stone (right section). 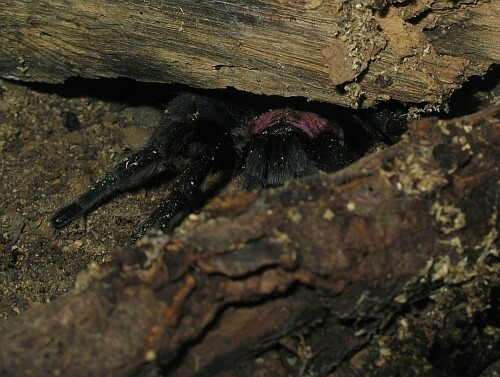 Next, I checked upon the other tarantula in the right section of the terrarium. 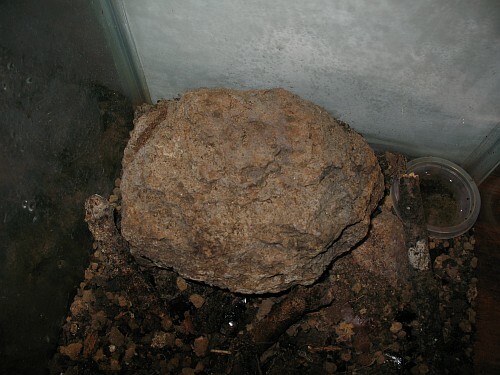 I carefully lifted the large stone the tarantula was hiding under, and noticed that it had molted as well. In the above photo you can see the exuvia (cast-off skin), through the large hole in the webbing. 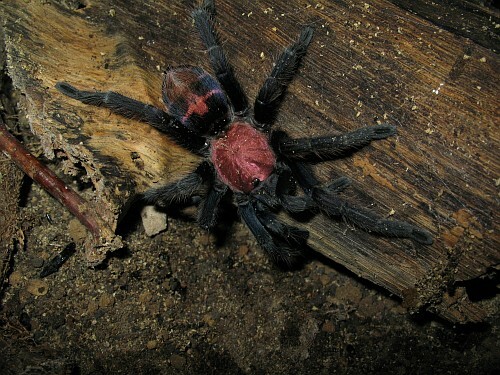 The tarantula is also clearly visible. The webbing was glued against the underside of the large stone, but when I lifted the stone it didn't stay stuck. The large hole has probably been made by the spider during the molting process because when I checked upon this tarantula several days ago there was no hole in the webbing. After I had taken a few photos of the exposed burrow I carefully put the large stone back into place because I didn't want to disturb the tarantulas too much. Cyclosternum fasciatum resting on a piece of wood (left section). A bit later I discovered that some of the photos I had made of the tarantula back in its cleaned terrarium section were made with the camera in "normal mode" instead of "macro mode". So I made several new close-up photos, in focus this time. Cyclosternum fasciatum walking slowly on a piece of wood (left section). The tarantula looks like it's a slow moving animal, but they can make a sudden run, so I had to be careful while taking photos inside its enclosure with no cover in place. Also, this species, when cornered, can kick urticating hairs from their abdomen. 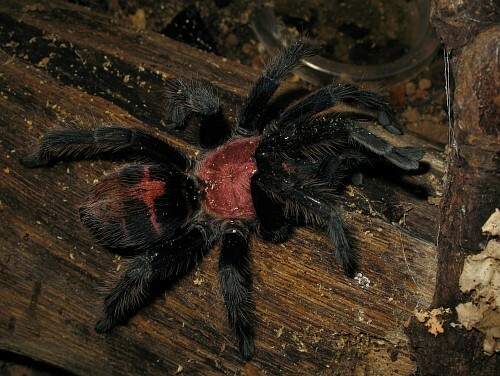 While I know how to avoid getting those hairs in my eyes or nose, I don't like it when the tarantula loses those hairs for no real reason at all. Cyclosternum fasciatum hiding under a piece of wood (left section). A bit later in the evening I noticed that the tarantula had found the hiding place I created under the piece of wood, so I took a photo of the large spider hiding through the glass of the terrarium. Cyclosternum fasciatum burrow - nice close-up photos of a Tigerrump resting in its burrow entry. Tarantula terrarium - more information on the terrarium I use.